Outdoor art and sculpture has been a part of humanity since before history was recorded. There is something about it that makes a very deep connection within the human psyche that is yet to be understood our explained. The need to create and to experience it seems to be very natural part of being human. Neolithic peoples built Stonehenge, the ancient Egyptians seemed compelled to decorated their entire nation and one statue even become the symbol of freedom and American liberty. Scattered around the world are thousands of examples of human art and creative ingenuity. This is Curious Britain’s collection of the top ten recent and most interesting outdoor sculptures. Over a thousand metres above sea level in the high Atacama Desert of northern Chile and seventy five miles south of Antofagasta is a surprising sculpture that reaches up through the sands. 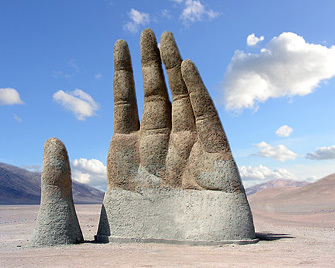 Known locally as the Atacama Hand it was created by Chilean sculptor Mario Irarrázabal in 1992. It is the third in a series of four hands that each has a subtly different meaning. The first known as ‘ Monumento al Ahogado’ or monument to the drowned was built on Brava Beach in the popular resort of Punta del Este, Uruguay. The second was constructed in Madrid in 1987 followed by the Atacama hand or ‘La Mano del Desierto’, The Hand of the Desert. A further replica was erected in Venice in 1995. The Atacama hand is made from a combination of steel, concrete and fibreglass and is 11 meters high. Funded by the ‘Corporación Pro Antofagasta’ (Antofgasta Tourism and Development Organisation) it has become a famous landmark of the Pan-American highway. Horizon Field is one of the most ambitious and visionary projects ever undertaken in the history of outdoor art and is the work of renowned British sculptor, Antony Gormley(OBE). 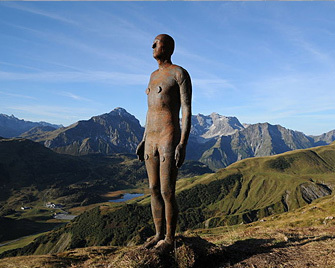 It required the creation of one hundred life-sized human figures made of solid cast iron which were then placed at specific locations over a 150 square kilometre area of the Vorarlberg Alps in western Austria. The statues are positioned at irregular intervals, some as close to each other as sixty metres while others are spaced more than a kilometre apart. Linked together, these artworks create a horizontal line that is consistently 2,039 metres above sea level and are meant to raise the question regarding humanity’s place in the world and universe. The majority of the figures are accessible but generally in areas that require some effort to reach. Some have been situated in more inaccessible locations that can only be accessed by hiking or skiing. Created in association with the Kunsthaus Bregenze, one of Austria’s leading contemporary art centres, the display will remain in position until April 2012. 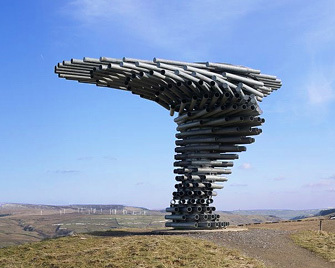 Part of the ‘Panopticons’ arts and regeneration project, the Singing, Ringing Tree is the brainchild of London-based architects Mike Tonkin and Anna Liu. Constructed from horizontally aligned galvanised steel pipes, this unique sculpture expands in size as it spirals upwards. It is three metres in height and located at Crown Point near Burnley in East Lancashire, England. Vaguely reminiscent of a surreal church organ it is actually meant to represent a tree. The majority of the pipes have been tuned so that they softly emit different tones depending on the direction and intensity of the prevailing wind. It was erected in 2006 and is one of four such Panopticon (wide-seeing) contemporary outdoor artworks. The Singing Ringing Tree won the Royal British Architects Award for Architectural Excellence in 2007. The connection between pan-pipes as a musical instrument and panopticons as a visual device has been suggested as the inspiration for the sculpture. 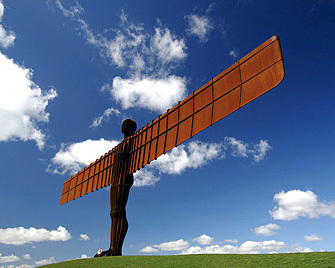 Weighing just over 200 tonnes, standing 20 metres tall and with a wingspan of 54m, equal to that of the Boeing 764, the Angel of the North is Britain’s largest statue of a human figure. Designed by the controversial British artist, Antony Gormley, it was constructed by Hartlepool Steel Fabrications and completed in 1998. It is located on a hill next to Low Eighton overlooking the Tyne Valley of Gateshead, England. Fabricated from Weathering Steel the ‘Angel’ has a natural reddish colour created by a layer of rust that forms a protective skin and creates such a dramatic contrast whenever the skies are blue. The statue is fixed to the ground using numerous concrete piles that reach a depth of 21 metres and ensure that it can withstand wind speeds in excess of 100 miles per hour. The wings tilt slightly forward and a little known maintenance hatch is located on the left shoulder to allow access to the hollow interior. Over the years it has drawn just about equal amounts of criticism and praise. Locally it is sometimes referred to as the “Gateshead Flasher”. 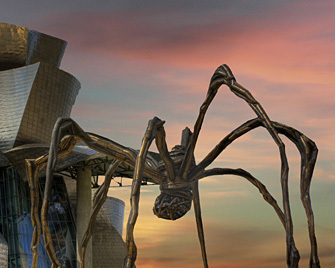 On permanent display outside the Guggenheim Museum in Bilbao, Spain, is a bronze cast (copy) of one of the most extraordinary and original sculptures created by Louise Joséphine Bourgeois. Entitled ‘Maman’ it is a representation of a giant female spider carrying 17 grey and white marble eggs. It is approximately nine metres in height and ten metres wide. The original was fabricated largely from stainless steel during 1999 for the opening of the Tate Modern in London on the 11th May 2000. The name ‘Maman’ is French for Mummy and was a tribute to the artist’s own mother who was a spinner and tapestry weaver. According to the artist its purpose was to represent the need for maternal care and nurturing in society even though parents can seem intimidating to a child. Her well known respect for spiders, and the unveiling of Maman earned Bourgeois the nickname Spider Woman. The last time that ‘Maman’ was displayed in London was 2007. Colossal statues tend to have a history of controversy and the 49m tall African Renaissance Monument of Dakar in Senegal, Africa, is no exception. Inspired by an idea of put forward by President Abdoulaye Wade and designed by renowned Senegalese architect Pierre Goudiaby, it depicts a traditional African family pointing the way to the future. All three figures are tastefully semi naked but the bare legs and (single) breast of the woman have angered some of the country’s religious leaders. The site chosen for the statue hasn’t helped and is one of two hills known as The Mamelles which translated into English means breasts. Considered one of the World’s largest bronze statues it was manufactured in North Korea at an estimated cost of 18.7 Million Pounds ($30 Million) which some of its critics feel could have be better spent of the social needs of the country. 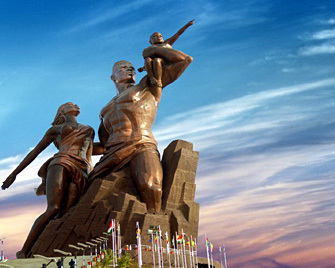 Its supporters point out that The African Renaissance Monument provides inspiration and motivation and is therefore worth many times the expenditure. It was inaugurated in April 2010. 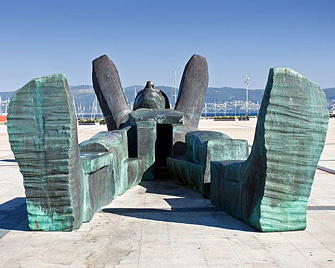 Located next to the Saxanxo marina in the Galicia district of Spain is the figure of a giant man lying on the ground with his hands behind his head. Given that Saxenxo is one of Spain’s premium tourist destinations it is not surprising that local myth claims that it is meant show a tourist relaxing in the sun. In truth it’s actually a modern representation of the Greek god Atlas and the brainchild of Galician sculptor Francisco Leiro Lois. Made in 2005 from saline resistant bronze, O Atlante is 14m in length, 4m wide and weighs approximately 20 tonnes. Sometimes called Atlas Dreaming, the statue does suggest a sleepy contemplation of the heavens. If it was upright and on a moderate plinth it would tower over the town reminiscent of the Colossus of Rhodes. By depicting Atlas (The Atlantic) at rest Francisco has created both an artwork and an allegory that can easily be missed … just as the awesome power of the sea can so easily be underestimated. When it comes to sculpture sometimes the simplest of ideas can be the most visually interesting. This is certainly the case with the Spoonbridge and Cherry centrepiece of the Minneapolis Sculpture Garden in Minnesota, USA. 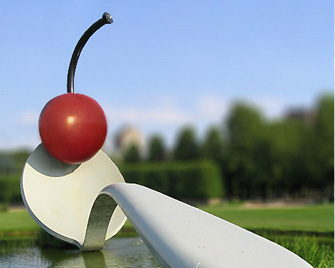 Designed by Claes Oldenburg and Coosje van Bruggen, the Spoonbridge and Cherry is a horizontal water sculpture that takes a plain silver-white spoon and energises it with a brilliant red cherry. Deliberately designed to be visually captivating it was also conceived as a horizontal form so as not to dominate other artworks on display in the park. When switched on, the stem of cherry acts as a fountain that releases a fine spray of water downwards onto the neck of the spoon. 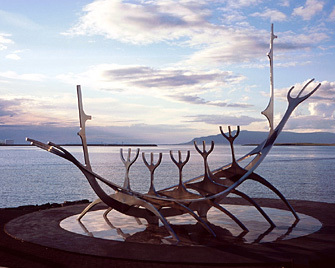 The intriguing Sólfarið sculpture, also known as The Sun Voyager, is a located on the seafront of Reykjavík in Iceland. Made from stainless steel it is a contemporary representation of the infrastructure of a Viking ship pointing out to sea where the sun sets in the north east. It is especially striking on a clear day during winter when it is dusted with snow and the mountains of Akrafjall, Esjan and Snæfellsnes gleam in the distance. It was created by Jón Gunnar Árnason, a founding member of the Icelandic Sculptors Society, in 1971 and has since become one of the ‘must-see’ landmarks of the city. According to various sources it represents the arrival of the first Nordic settlers. 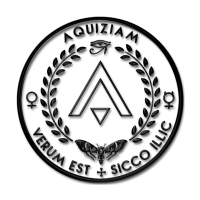 It is also said to represent mankind’s quest for new physical and spiritual destinations. Approximately nine metres in length and close to four metres wide the Sun Voyager is considered to be one of the most photogenic sculptures in the World – it is certainly the most photographed artwork in Iceland. Perhaps the most curious of all the artworks listed here is the Floralis Generica which is located in the Plaza de las Naciones Unidas, Palermo, Buenos Aires, Argentina. Made largely from steel and aluminium it is an automated representation of the all the world’s flowers and known as an environmental kinetic sculpture. Said to be a synthesis of technology and the natural environment, it is located above a 41m wide reflecting pool to emphasise both its shape and to provide additional natural light. Controlled by sophisticated mechanics it opens and closes its 13 metre long petals depending on the amount of light available and other climatic conditions such as wind. 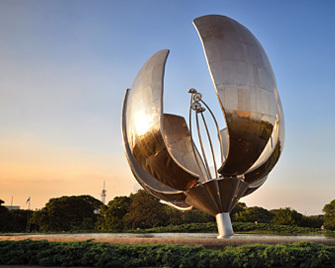 It was created in 2002 by Argentinean born architect Eduardo Catalano and given to the city as a gift. The Floralis Generica is centrally illuminated red at night and closely resembles a short-stemmed tulip with six curving petals that surround four central stamen. It is 23 metres in height and said to weigh more than 18 tonnes.